On a manual treadmill, the action of your feet against the deck moves the belt. The belt only moves if you move it. Both runners and walkers expend more effort on a flat belt non-motorized treadmill than on a motorized treadmill. This has fitness benefits as users can get their heart rates into a higher zone at a lower speed. On a manual treadmill, the action of your feet against the deck moves the belt. The belt only moves if you move it. 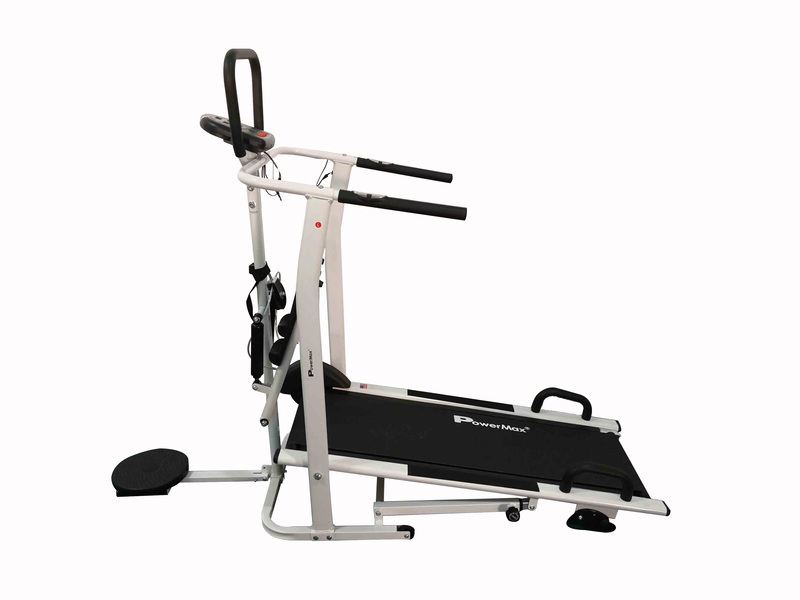 Both runners and walkers expend more effort on a flat belt non-motorized treadmill than on a motorized treadmill. This has fitness benefits as users can get their heart rates into a higher zone at a lower speed. 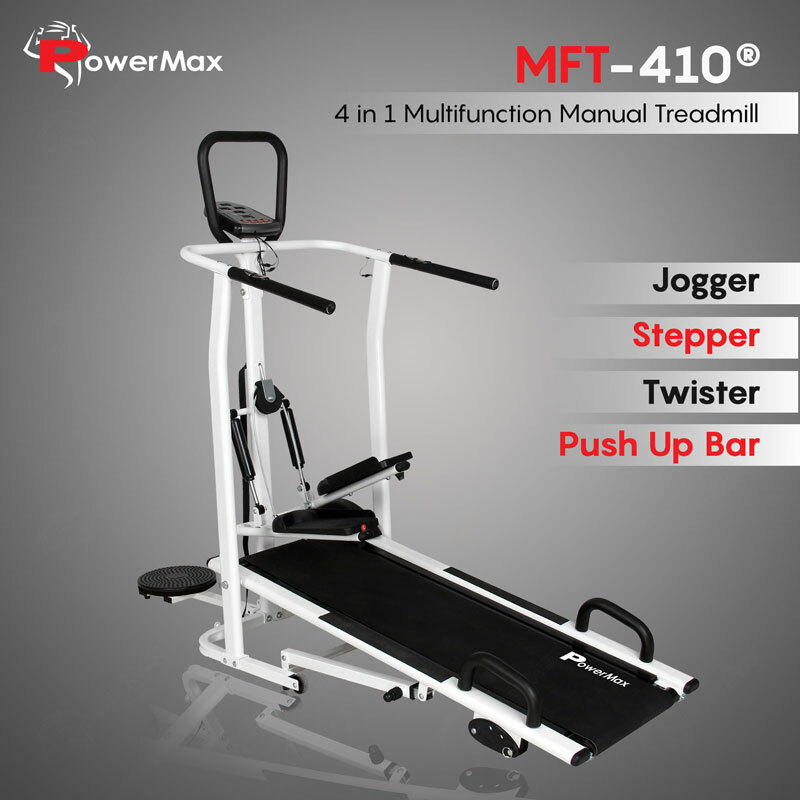 EcoTrek Series MFT-410 is four in one multifunctional manual treadmill. 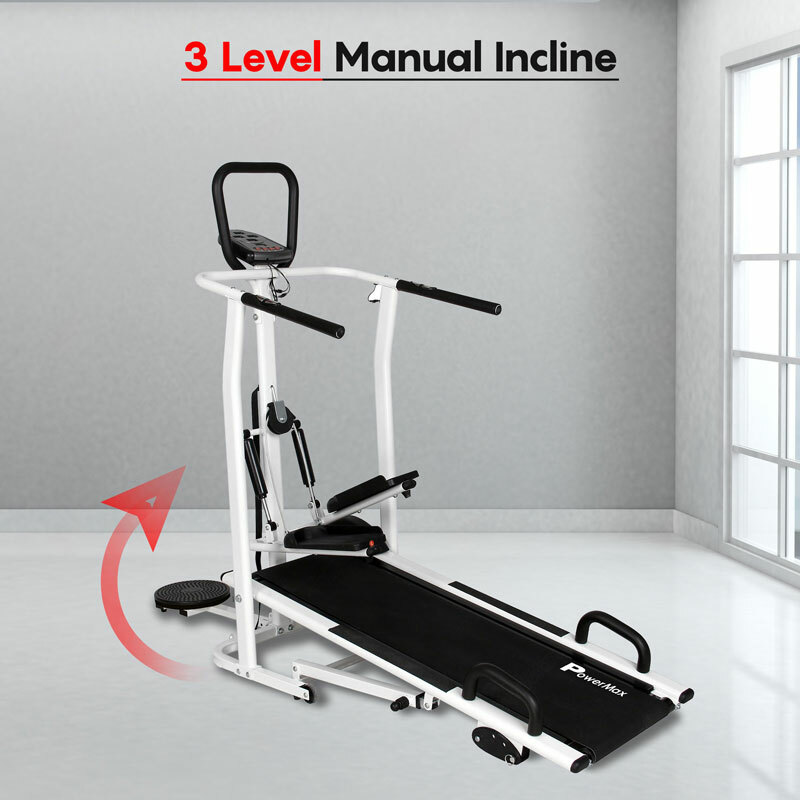 One can jog, step up, twist and can do push up on it along with this it has 3 levels manual incline with High Quality and Strong Steel Frame. This EcoTrek Series MFT-410 has Width of 1160 x 335mm Running Surface. It is lightweight, durable, compact and easy to store machine. 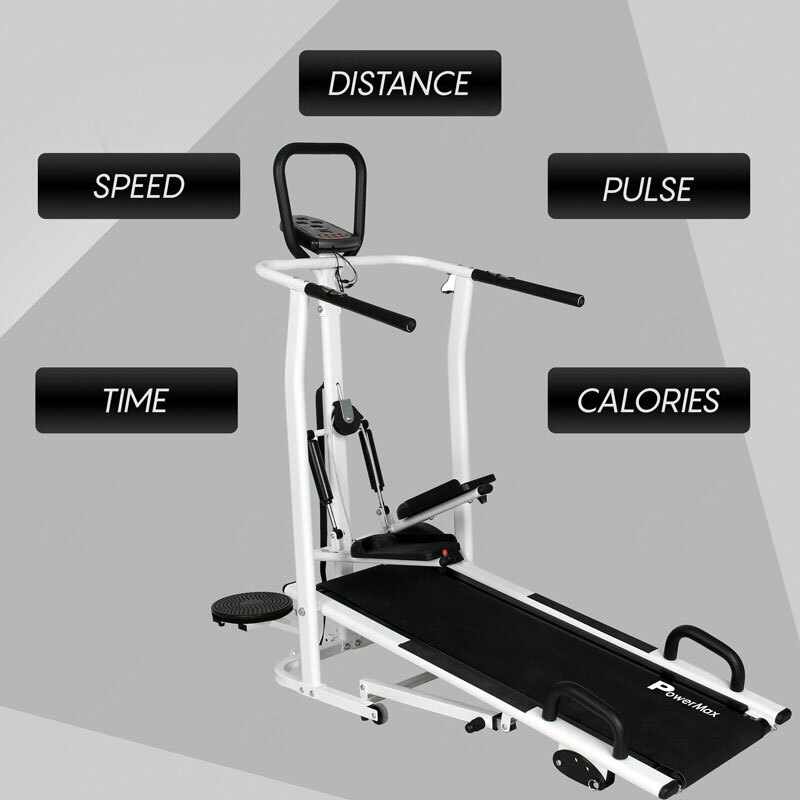 Powermax also provides a wheel for transportation of treadmill. A person will be Capable of Jogging and running. The frame has been reinforced to accommodate a high weight capacity, with a wide side rail for safety and provide walking security and preventing any loss of balance. Muscle-powered: You provide all of the motive power and exercise your lower body. It is likely that you will expend more calories per mile. You control the speed by putting in more effort rather than trying to keep up with a moving belt. On a Flat-belt treadmill, you speed up by placing your feet further forward and slow down by striking closer to the center of the belt. No electricity needed: You can use a manual treadmill anywhere and aren't dependent on placing the treadmill near an electrical outlet. 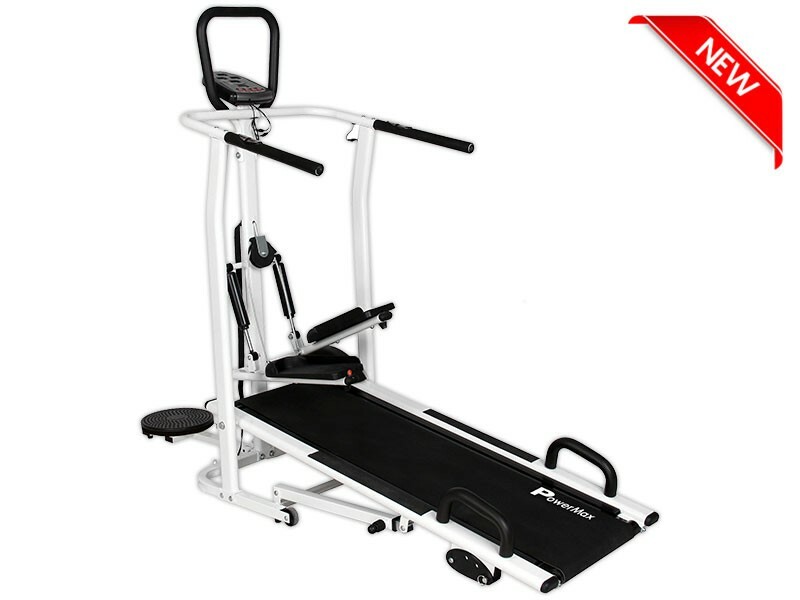 Safety: A non-motorized treadmill stops when you stop; you don't have to wear a safety cord to stop it if you slip and fall as you should with a motorized treadmill. High-intensity interval workouts: Athletic trainers use manual treadmills as part of workouts that alternate high and moderate intensity. Many professional sports teams use these models for training, doing sprint intervals on the manual treadmill. Your pace and motion control the speed. Helps to release joint pain. Helps in losing weight faster. 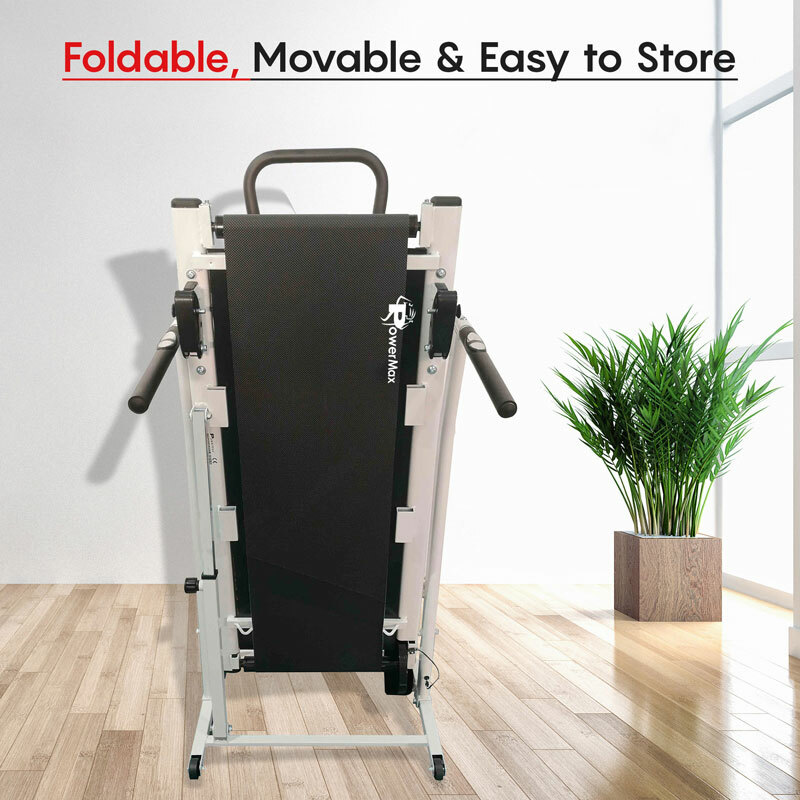 Manual Treadmill folds for easy storage. 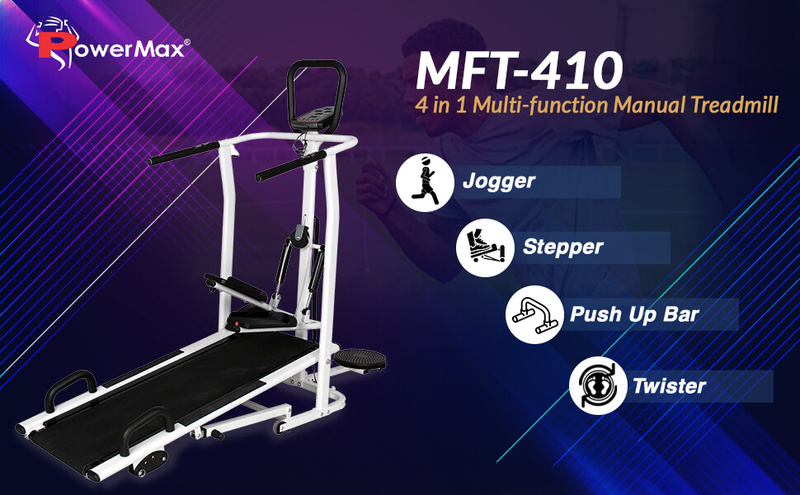 One can use this treadmill in four ways: Jogging for burning fats, Stepper for leg exercise, twist for waist and push up bar for muscles gaining. The treadmill holds up to 3 levels of auto incline. 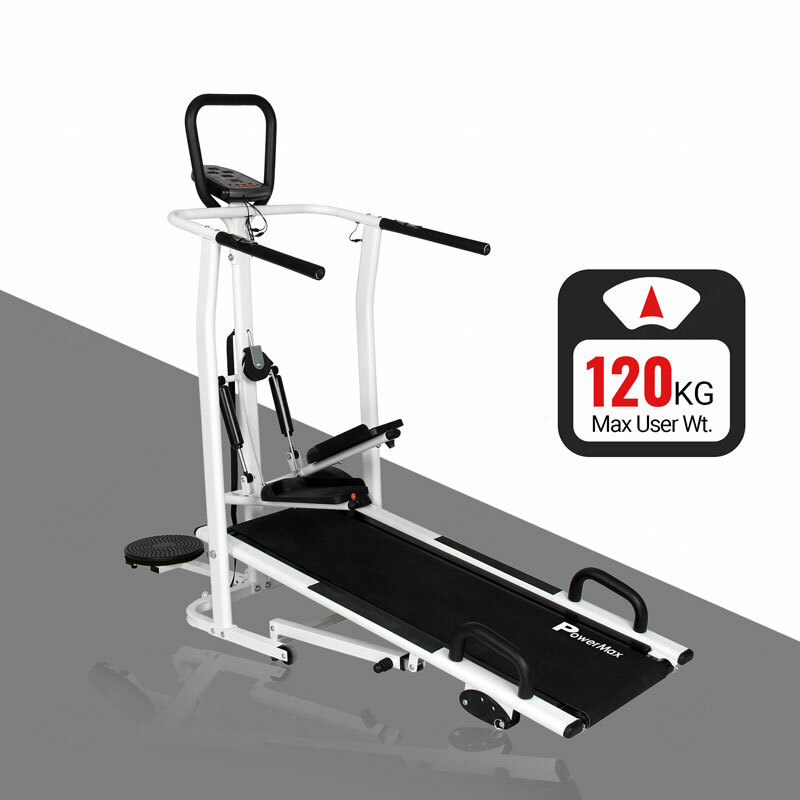 Powermax fitness offers 1160 x 335mm of running surface for comfort walk/run on treadmill. It has four target based program. MFT-410 has Bubble Etched Running Belt. Lifetime Frame warranty, parts, and wear items one year warranty.